Baseball was the iconic American game long before football. It was the Saturday afternoon pastime when families and friends gathered at the local park and cheered on teams made up of various local businesses, churches or organizations. Little League was the perfect place for boys, then for girls, too, and – as the years went by – younger kids joined T- ball teams. It was never a great game for television – it is hard to gauge those innings since they depend on “outs”, not a ticking clock. But it was and still is a game that encourages cheering on favorites, chowing down on peanuts, popcorn and cotton candy while getting together with friends and family. Catching a ball that makes it into the stands and then getting it autographed makes a perfect game for many fans or if you can’t catch the fly, at least getting an autographed ball. That is one big difference between baseball and football – you will hardly ever see a football make it into the stands. Word walls, posters and pennants are ways to show your loyal fandom or to display your enjoyment of the game. A giant word or picture that focuses on baseball can turn a blank wall into a place for your special posters, cards, and even photographs. If you can catch one of you and your favorite player – that’s just pure gold. Throw pillows are the perfect way to display your fandom, and they are kind of handy with those stadium seats, as well. No need to sit on a hard bench if you have a nice, fiberfill pillow to cushion your behind. More than that, you can coordinate your room colors with the colors of your favorite team. Use wall hanging or tabletop lamps with a baseball theme to light your world. It could be an advertising light with a team name on it or a table lamp that has a base shaped like a baseball. Or maybe it is just the word “baseball” picked out in lights. Whatever it is, you already know that baseball lights up your world – so don’t be afraid to show it. Below are ten examples of baseball-themed decorations. Enjoy. Protect your little slugger’s favorite bit of memorabilia – that signed baseball from your super weekend together. 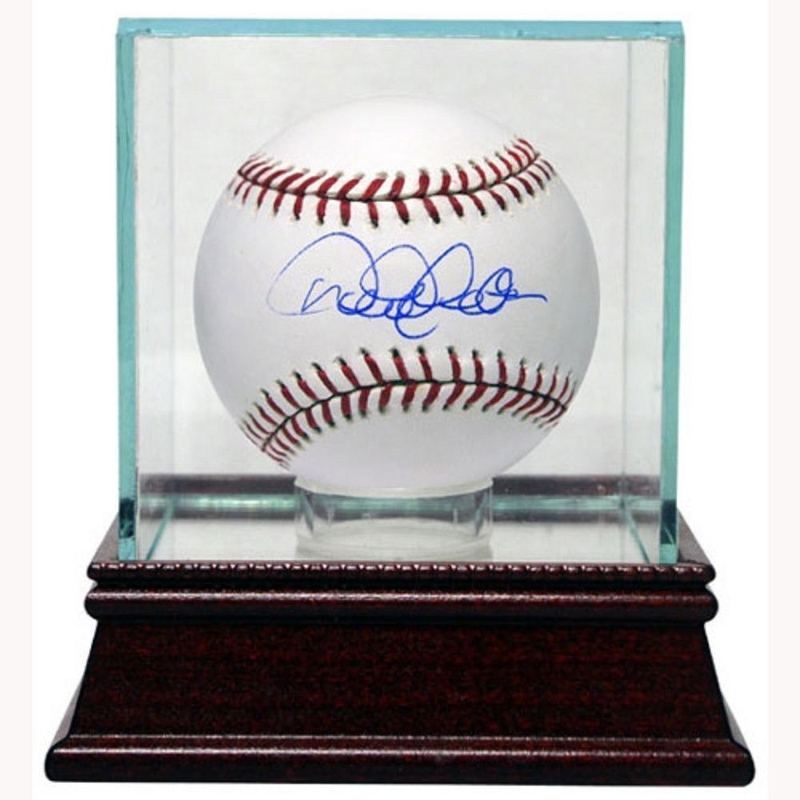 Whether you are celebrating mom or dad’s special day, a birthday or just enjoying a chance to get together with your kid, a signed baseball is something hugely special. This case will keep that special moment preserved behind glass. A must have for any baseball fan. Relax and dream of games with one or more of these square pillows with black silhouettes of baseball players against a red and yellow city skyline. Perfect for your own den or bedroom or for that baseball fanatic who clutters your house with balls, bats, gloves and collector’s memorabilia. Add an exclamation point and this one word says is all – BASEBALL! From 7055 Inc., this handcrafted steel word will tell the world what you or a family member or friend thinks of baseball. The second B in the word is crafted to resemble two baseballs. The bold, black letters are perfect to head up a wall of posters, cards and more. Powder coated metal line drawing in of a baseball pitcher winding up to let go. Team this metal artwork up with the word “Baseball,” some posters and maybe even some pennants and baseball cards for a fan display that can’t be beaten. Makes a great gift for anyone who loves baseball, or keep one for yourself. A circle with artistic “baseball” seams is decorated with lights around the rim and with a square of four in the center. An excellent piece for a club, school sports room, or similar area. It can even be used in a child’s room as a nightlight. Made from 20 gauge steel, it is sufficiently durable for almost any venue. Encouraging words for anyone – not just sports fans. Babe Ruth is shown in silhouette, holding a bat upraised. The quote says, “Every strike brings me closer to a home run.” In a world where success is valued, it is a reminder that failed tries is part of practice and the foundation on which success is built. This red-striped throw pillow from One Bella Casa is perfect for your baseball fan’s bed or couch. It has a baseball picture plastered against seven red and white stripes. The word “baseball” is woven into the red stripes just below the baseball. The pillow is made from woven polyester and stuffed with fiberfill. The base of this small table lamp is shaped like a baseball. Make your baseball fan happy with a light that puts his or her favorite sport the last thing they see before closing their eyes at night. Perfect for snuggling down and reading about how the baseball greats slugged their way to fame and fortune.